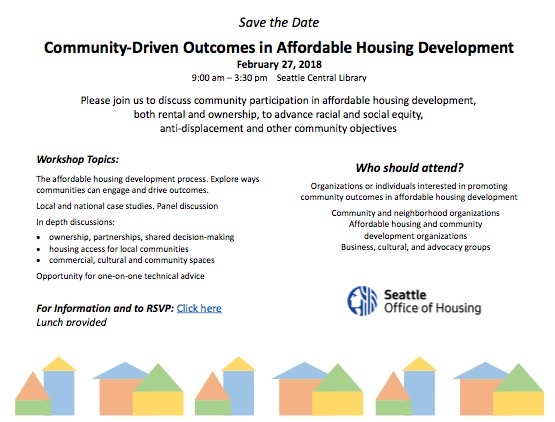 The Office of Housing is hosting a workshop on February 27th to highlight approaches that achieve community-driven outcomes in affordable housing development. 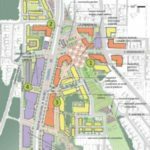 The workshop will provide information about affordable housing development and both national and local case studies of community-driven developments. 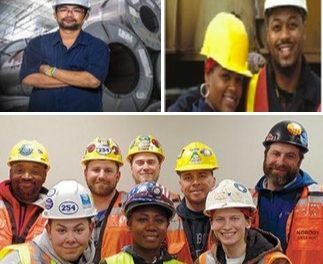 The workshop is intended for anyone interested in advancing racial and social equity, anti-displacement, and other community objectives in housing development. We are looking forward to an interactive session with a lot of opportunity to share experience and perspectives that will inform our work. 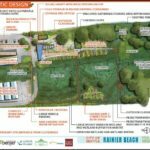 This workshop is being planned with help from community organizations and other City departments. We hope you can join us. Please save the date and RSVP. We will send more information as the date approaches. If you have questions, please contact me or Emily Alvarado, Policy and Equitable Development Manager. 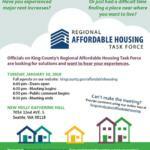 November 2, 2013 Puget Sound Equity Summit – Come see Rainier Beach SHOW OUT! PreviousSpring Into Summer Community Carnival!